THANK YOU, Graduating Class of 2001, Fellow Honorary Degree Recipients, Distinguished Administration and Faculty, Alumnae, Parents, Family and Friends, thank you all so much for inviting me to speak with you today. I graduated from Mount Holyoke in 1985. Here I am 16 years later. The learned faculty is seated there behind me, and so, before I get into the swing of things, I want to state that any grammatical errors, historical fabrications and inappropriate flights of fancy contained within the following speech are the sole responsibility of the Commencement Speaker and, if found objectionable, should in no way be viewed as an example of the caliber of education one would receive at Mount Holyoke College. It is commencement and you all are commencing—you are beginning. Today is your birthday. Its a sort of birthday for me too: this is my first honorary degree. You are sitting there looking forward into me and I’m standing here looking forward into you. I’ll be your mirror for a few minutes, if you’ll be mine. All of us together, we are commencing. It is the beginning of things, its also the end of things and Ive brought along 16 SUGGESTIONS which may be of use — as you walk through the rest of your lives. Suggestions and Advice are funny things. In 1982 I took a creative writing class with James Baldwin. He suggested to me that I try playwrighting and I tried playwrighting and here I am today. That was some good advice. But it wasn’t the best advice I ever got. The BEST advice I ever got was also the WORST advice any one ever gave me. In high school I had a very stern English teacher and one gloomy day she summoned me into her gloomy office. She knew I loved English and that I wanted to study literature and perhaps someday become a writer — «Don’t study English,» she said, «you haven’t got the talent for it». What a horrible thing to say. What an excellent suggestion. It was an excellent suggestion because it forced me to think for myself. And thats my first suggestion for you. CULTIVATE THE ABILITY TO THINK FOR YOURSELF. When someone gives you advice, you lay their advice along side your own thoughts and feelings, and if what they suggest jives with what you’ve got going on inside, then you follow their suggestion. ON THE OTHER HAND — there are lots of people out there who will suggest all kinds of stupid stuff for you to incorporate into your life. There are lots of people who will encourage you to stray from your hearts desire. Go ahead and let them speak their piece, and you may even want to give them a little smile depending on your mood, but if what they suggest does not jive with the thoughts and feelings that are already alive and growing beautifully inside you, then don’t follow their suggestion. THINK for yourself, LISTEN to your heart, TUNE IN to your gut. These are just the things for which Mount Holyoke has educated you. You’ve all received an excellent education here and education, excellent education, is just a kind of ear training. That’s all it really is — Inner Ear Training. EMBRACE DISCIPLINE. Give yourself the opportunity to discover that discipline is just an extension of the love you have for yourself — discipline is not, as a lot of people think, some horrid exacting torturous self flagellating activity—Discipline is just an expression of Love — like the Disciples — they didn’t follow Christ because they HAD TO. PRACTICE PATIENCE. Whether you sit around like I do, working for that perfect word, or you are working toward a dream job, or wishing for a dreamy sweetheart. Things will come to you when you are ready to handle them — not before. Just keep walking your road. And as you walk your road, as you live your life, RELISH THE ROAD. And relish the fact that the road of your life will probably be a windy road. Something like — the yellow brick road in the WIZARD OF OZ. You see the glory of OZ up ahead — but there are lots of twists and turns along the way — lots of tin men, lots of green women. DEVELOP THE ART OF MAKING A SILK PURSE FROM A SOW’S EAR. Cause, you know, it ain’t whatcha got, its how you work it. For every 30 min of TV you watch, READ one poem outloud. For every work of literature you read, spend at least 30min in the mall, or in a mall equivalent such as Wal-Mart. This is cross-fertilization — a now-age form of crop rotation — a way to cross train your spirit and keep interested in everything and not get too stuck in your ways. GET OUT OF YOUR WAY. You can spend your life tripping on yourself, you can also spend your life tripping yourself up. Get out of your own way. You are young, brilliant, and today is your birthday. You’ve got your whole lives ahead of you and each of you will spend your life doing some thing, or maybe a host of things. Don’t just spend your life. SPLURGE YOUR LIFE BY DOING SOMETHING YOU LOVE. My husband Paul is a musician. He says that the concept of talent is overrated because «talent» is really the gift of love. «Talent» happens when you are in love with something and you devote your life to it and its your love of it that makes you want to keep doing it, its your love of it which helps you overcome the obstacles along the way, and its your love of it that begets a talent for it. Eat Your Vegetables, Floss Your Teeth, Try Meditation, Get Some Exercise, & SHARPEN YOUR 7 SENSES: the basic 5 Senses + the 6th Sense: ESP & the 7th Sense which is your sense of HUMOR. 16 years ago I sat where one of you is sitting now. The class of 1985 was graduating. And we were lucky as we had a great poet speaking to us. She was a great writer and an MHC alum. She was pretty and poised and she had such grace—so much grace that I sat there looking at her thinking that she looked more as if she had gone to Smith. Anyway it was sunny and we were all in black probably sweating a little and she spoke brilliantly and eloquently and to this day I have absolutely no memory of what she said. I don’t remember one word of her brilliant commencement address the address that launched the class of 1985. Not one word. I want you to catch my drift. I’m not saying our speaker was boring. I’m saying that I don’t remember what she said. But I do remember some words that went through my head at the very moment our speakers words were passing by. 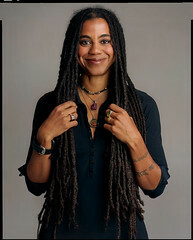 It was a voice, coming from my gut, a voice coming from my heart and the voice said: «Ah, Suzan-Lori Parks, the next degree you’re going to receive is an honorary degree from MHC». Yep I really said that to myself. And here I am today. SAY «THANK YOU» at least once a week. 16 years from now who will remember these words? Maybe no one. But maybe someone will. Maybe, from back in 1985, there is a classmate of mine who, to this day, remembers every word of our commencement address and this classmate repeats those words and they lighthouse her stormy days, maybe. Or if not a classmate remembering then maybe an alum if not an alum maybe a family member, maybe a parent, up there, gathered in the background having given so much, helping you get to this special day. Whether my words today will be remembered is not the issue because, you see, what I’m saying to you right now isn’t as important as what you are saying, right now, to yourselves. BE BOLD. ENVISION YOURSELF LIVING A LIFE THAT YOU LOVE. Believe, even if you can only muster your faith for just this moment, believe that the sort of life you wish to live is, at this very moment, just waiting for you to summon it up. And when you wish for it, you begin moving toward it, and it, in turn, begins moving toward you. As the great writer James Baldwin said: «Your crown has been bought and paid for. All you have to do is put it on your head». Запись опубликована в рубрике In English, Что с метками be bold, believe, love, Mount Holyoke College, suggestions, Suzan-Lori Parks. Добавьте в закладки постоянную ссылку.